Beautifully crafted in Nepal our singing bowls are used worldwide for yoga, meditation and spiritual healing. Widely used by energy healers, spirituality practioners and those just looking to experience a beautiful daily resonance, the sound and vibrations promote a relaxed state. This attractive bronze Buddhist bowl comes as a set that includes a wooden striker, a decorative pillow cushion and a hand made lotka paper journal. It can be said that illness is a manifestation of dis-harmony within the bodyâ€"an imbalance in the cells or a given organ. Since all matter is energy vibrating at different rates, by altering the rate of vibration we can change the structure of matter. Sound from Tibetan Singing Bowls entrain the brain to move into the Theta brain wave frequencies that induce deep meditative and peaceful states, clarity of mind, and intuition. The sound vibrations impact our nervous system, engaging our relaxation reflex and inhibiting the stress or pain response. All Ohm Store products come with our product guarantee. HAND HAMMERED TIBETAN SINGING BOWL SET - This is a full set of singing bowl, wooden striker and hand sewn cushion. Made in the Himilayan Foothills, our products are produced by Nepalese artistans to create an ambience for emotional calming and healing. HAND MADE LOTKA PAPER JOURNAL - Lokta Paper is a wildcrafted, handmade artisan paper indigenous to Nepal. These are pocket-sized journals that capture the essence of the hand crafted artisanal approach to creating products with intention and care. 100% MONEY BACK GUARANTEE rock solid, lifetime guarantee on our full line of products. No matter what and when. Contact us and we will make you happy! 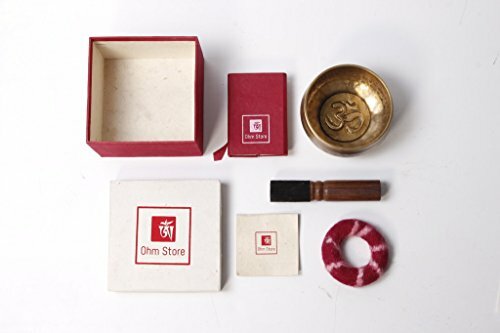 If you have any questions about this product by The Ohm Store, contact us by completing and submitting the form below. If you are looking for a specif part number, please include it with your message.